L to R: Photos by Matt Gilmore, Janae Rempel, David Jackson, Yee Mar. Centralia/Wetmore senior J.T. Rosine stood in the middle of the Panther faithful following the Panthers’ 61-0 victory against La Crosse in the Class 2-1A state championship game Saturday at Fort Hays State University's Lewis Field Stadium. The win marked the biggest margin of victory in Kansas 11-man state finals history and capped a dominating 13-0 season. One young fan walked up to Rosine with his father. The son, who held a well-crafted Rosine bobblehead, wanted a photo. Rosine obliged. Another woman came to the quarterback and told him that a friend received a high-five from Rosine in pregame, and then didn’t want to wash her hand. Rosine simply smiled. Rosine’s joy was also prevalent throughout the state’s three biggest favorites to win state crowns: Derby in 6A, Centralia and Baileyville B&B in Eight-Man, Division II. Centralia and B&B never dropped from the No. 1 spot all year. Derby, after a loss to eventual Class 5A runner-up Salina South in Week 1, eventually regained the top spot. Derby won its second football crown, first since 1994. Centralia collected its third title in five years and B&B won its second straight crown and fourth in six seasons. Centralia and B&B also swept volleyball titles, too. B&B will now close its doors and consolidate with Seneca-Nemaha Valley to form Nemaha Central. However, all three teams never felt constant pressure to have to win a crown. Even in the summer, Derby senior safety Travis Young wore a smile when he talked about the expectations. Centralia and B&B wanted to win, but both talked about how much support they had from the town. In some towns – and I’ve seen it happen in other sports, especially wrestling – the pressure of state championships can sometimes be nearly unbearable. Not so with the heavy favorites. B&B completed one of the great eight-man runs in Kansas annals (only Midway-Denton and Hanston can compare) with a 12-1 season that featured just a 29-28 loss to Madison in Week 1. The Falcons trailed 7-6 after the first quarter, but eventually defeated Wallace County, 42-19. After every contest, the Falcon fan base lined up on the sideline and congratulated the players and coaches. That even occurred after state when the temperatures dipped well below freezing. Centralia, which outscored opponents 660-67, is in the mix as the greatest Class 2-1A teams of all time. Last season, the Panthers lost an 11-point lead to Meade in the final three minutes in the state championship. “They are very humble, very fun bunch to work with,” Centralia coach Larry Glatczak said. “They just love to play football. That’s the key thing. You don’t get very many groups that come through – just everybody loves playing on Friday nights. The goal was state, but the team enjoyed the preparation and season. Centralia outscored opponents 472-6 in the first half. A 10-win season is considered an elite year. Just 31 teams won double-digit victories this year and just 15 have 10 or more games in the last two years. B&B and Wallace County are the lone eight-man teams to accomplish the feat. Go back three seasons, and it drops to eight squads: Class 5A Bishop Carroll, Class 3A Silver Lake, Scott City and Sedgwick, Class 2-1A’s Centralia, Meade and La Crosse and B&B. Just six teams (minus Sedgwick and Centralia) have accomplished the feat in last four. Six of the squads have won at least one state title in the last four years. La Crosse, which has won at least 10 games in six of the last seven seasons, has finished state runner-up, sub-state and state runner-up the last three years, the best three-year finishes in Leopard annals. La Crosse will carry a 36-game regular season winning streak in 2013, currently the longest streak in school history. Sedgwick, which finished third in Class 3A in scoring offense at 576 points, has enjoyed the best three-year run in school annals. Coach Jeff Werner has led the Cardinals to 10-1, 10-2 and 10-2 records the last three seasons. However, La Crosse and Sedgwick will be among the state favorites in 2014 – mainly because of their talented junior quarterbacks in the Leopards’ Jack Garcia and the Cardinals’ Brylie Ware. Garcia and Ware headline a strong group of non-senior quarterbacks, which also includes Osborne sophomore Jake Tiernan. He helped Osborne break eight-man records for points (760), and individual and team completion percentage (78 percent). Among current juniors, Ware led Kansas in passing yards (2,915) and had a 29/7 TD/INT ratio. Garcia, in his second full year as a starter, had 2,041 passing yards and a 31/7 TD/INT ratio. 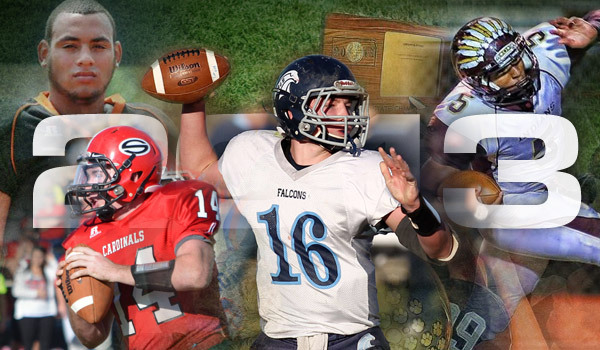 Five juniors eclipsed 2,000 passing yards; just three broke the mark in 2012, according to maxpreps. Beloit-St. John’s/Tipton junior Trey Dubbert has played since his freshman year and had a 20/4 TD/INT ratio on a sub-state runner-up team. Junior Trey O’Neil, the coach’s son, paced Scott City to the Class 3A sub-state. Hanover junior Andrew Bruna did the same thing. Hays High’s Alex Delton; one of the nation’s top prospects, but who missed part of 2013 with injury; McPherson’s Kyler Kinnamon, Lansing’s Krystian Abbott and Chetopa’s Philip Moses also headline a strong junior class.